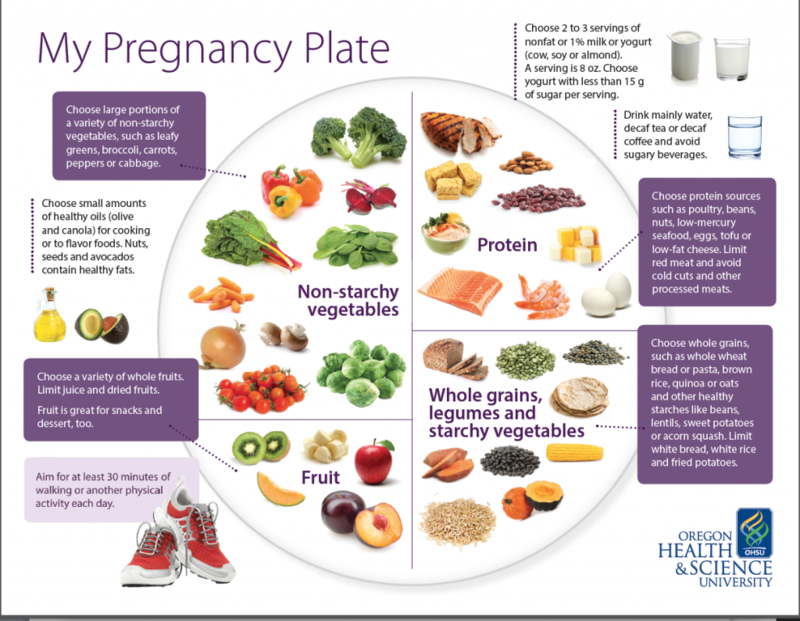 Eating healthy during pregnancy is imperative to the development of a baby in the fetus. It is important to make sure that the child gets the right nutrients with a balanced diet. The development of a baby is hard work on a woman’s body, so it is important to supply he body with the best types of food to help grow healthy and develop normally. There is no one healthy weight for pregnancy, as it can vary depending on the woman. Some general guidelines can follow. The average total weight gain for a healthy woman during pregnancy is 25 to 35 pounds. If a female is an overweight, she should only gain 10 to 20 pounds during her pregnancy, so that risk are not alleviated to higher levels. An underweight woman pregnant with twins or more should between 35 and 45 pounds during the pregnancy. You should ask your doctor how much weight you should gain during your pregnancy to remain in a healthy range. When people say eating for two, it does not mean eating twice as much food. Pregnant women only need about 300 extra calories a day. The most important part is what type of calories you are eating. Eating junk food and sweets, will add calories to your diet without providing the proper nutrients that are vital for the baby’s development. In this case, the baby will start to take the critical vitamins and minerals it needs from the mother’s body and the mother’s health will suffer because she is not getting the nutrients she needs. The mother must look out for her health as well as the baby’s health. There other nutritional needs for a growing baby. Iron helps the baby’s blood supply and prevents anemia from developing in the mother. Folic acid helps reduce the risk of Spina Bifida (which is the unfinished closing of the spinal column) and other birth defects such as anencephaly, a defect of the brain. Eating A sufficient diet with the appropriate amount of nutrients and getting at least 30 minutes of calories per day is important to maintain a healthy pregnancy. The vegetable is a must have – Vegetables will provide the mother and baby with Vitamins A and C as well as folic acid, iron, and magnesium. You should eat between 4-5 servings a day would be a good practice, with at least two with green leafy vegetables. Eating 3-4 servings of fruit a day is recommended for vitamins A and C, fiber, and potassium. Fresh fruits are better than frozen canned fruits. Avoid juices with sugar or sweeteners added, eat plants of vitamin C citrus fruits, berries, and melons. Dairy products such as milk yogurt and cheese should be eaten three servings a day.Dairy products offer an excellent source of calcium, phosphorus, and protein. However, be careful to limit calories and cholesterol intake and choose nonfat dairy options. Protein foods such as eggs, nuts, meats poultry, fish, and dry beans can be eaten three times a day. These foods provide Vitamin B, protein, zinc and iron. A pregnant mother must also have some fat in her diet fro the baby; Fats offer long term benefits like energy, that every baby needs for growth and brain development. Women with special needs diets should plan their meals carefully to ensure that get all of their nutritional needs. You should consult a dietitian particular if you have special diets such as lactose intolerant, gluten-free, vegetarian or vegan restrictions. Pregnant women should drink plenty of liquids. Try to avoid sugar and caffeine drinks. You should ask your doctor how much fluids you should drink each day. Prenatal vitamins are also a good idea to ensure that you get the vitamins and minerals that are essential during pregnancy. Your doctor may give you a prescription for vitamins, but you also can get them over the counter. Any one particular reason can not explain food cravings. Many pregnant women have cravings for particular food. It may because by hormonal shifts, but they often fade after the first three months of pregnancy. As long you getting all the nutrients and minerals needed for you and the baby, it completely fine to have food cravings now and then. There were occasions when women can have a craving for things that are not food, such as dirt, clay or ice chips. This is called Pica and may be due to too little iron in the blood. If you have these types of cravings, let your doctor know.